“The object isn’t to make art; it’s to be in that wonderful state which makes art inevitable.” So said Robert Henri, one of the renowned painters in the first part of the 20th century who found inspiration in Santa Fe, N.M. 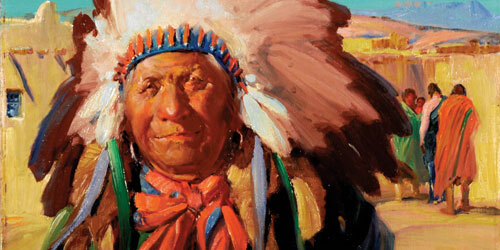 Southwestern Allure: The Art of the Santa Fe Art Colony runs through Dec. 29 at the Boca Raton Museum of Art. The exhibition features 50 works by such noted artists as Henri, Edward Hopper, Carlos Vierra and Stuart Davis who, from 1900 to 1938, turned Santa Fe into a vibrant center of American creativity. Most of the artists came from the East. In and around Santa Fe, they discovered a new world of landscapes, desert colors and Native American and Hispanic influences in art, architecture, and customs. The confluence of nature and culture led to the inevitable: a flowering of artistic expression that continues in Santa Fe to this day.